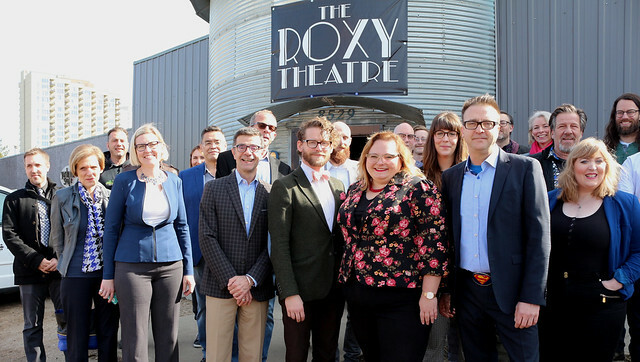 Deputy Premier Sarah Hoffman joined by Garner Beggs, vice chair of the 124th Street Business Association, members of the Theatre Network board and representatives from the Edmonton’s arts and business community announce provincial support for the building of the new Roxy Theatre. The province will provide $2.5 million in funding to Theatre Network to help support construction of a new facility to replace the original Roxy, destroyed by fire in 2015. The new facility, to be located on the site of the original theatre, will include three distinct performance spaces and integrated backstage and front-of-house areas. In a nod to the past, the design of the building entry will help recreate the historic character of the Roxy Theatre marquee on 124 Street. The $12.5-million project is expected to create an estimated 51 direct jobs during construction and generate almost $2 million annually in economic activity. Theatre Network is looking to break ground on the project in spring 2019 and is targeting completion to coincide with the 2020 theatre season. The $2.5 million in provincial funding will be provided through the Other Initiatives Program using existing resources in Culture and Tourism’s 2017-18 budget. The project has also received initial support from the federal government and the City of Edmonton. The original Roxy Theatre opened in 1938 with then Mayor John Wesley Fry and Lt.-Gov. John C. Bowen in the audience. The Roxy operated as a movie house until 1988. The building was purchased and transformed into live performance space and in 1990, became the new home of Theatre Network. In 1996, the Roxy hosted the first Nextfest, an event showcasing and providing development opportunities for emerging creators and producers. The 2018 edition of Nextfest will feature NEXTNextfest, highlighting the work of high school artists.